How many different ways are there to do fruit and Jell-O? A lot, apparently. Fruit Refresher is actually a refreshing change from Jell-O with Cool Whip and mayonnaise. (I guess it’s kind of like that old saw about how the best thing about beating your head against a wall is it feels so good when you stop.) 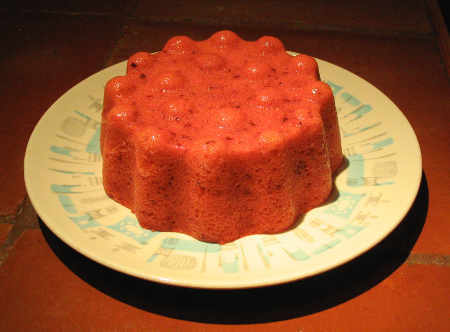 The recipe calls for fresh berries or fruit, which is good since Jell-O is always better with fresh/real ingredients. Mid-December is not exactly the best time for fresh berries in New England, but I found some decent-looking blackberries at the supermarket. 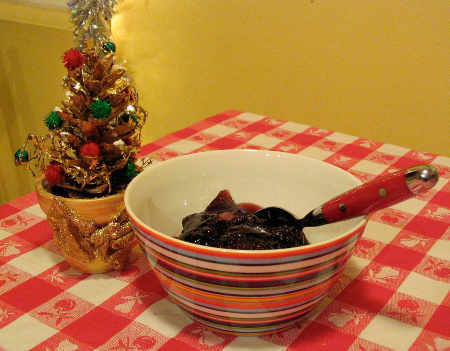 I macerated the berries in sugar, drained them, and used the resulting syrup as part of the cold liquid for the gelatin. The Jell-O could be any flavor, and since I just needed to dissolve it in boiling water, I decided I’d better start using up my sugar-free Jell-O. I went for black cherry, which was not only sugar-free but also a flavor I hadn’t used before. 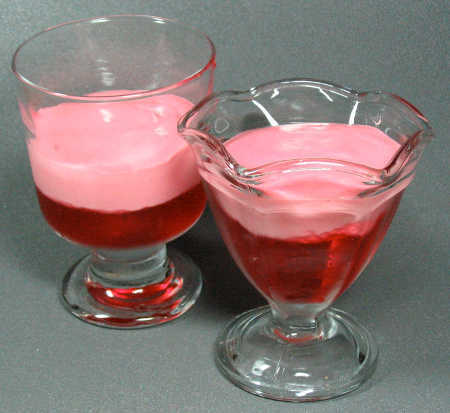 The preparation was simple – dissolve gelatin in boiling water, add cold liquid, chill until thickened, add the fruit, and chill. 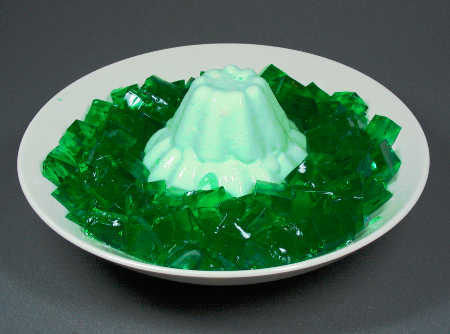 I’m very tired tonight for some reason, so it was nice to have a relatively stress-free Jell-O, no unmolding, it just got spooned into our funky MoMA ice cream bowls. 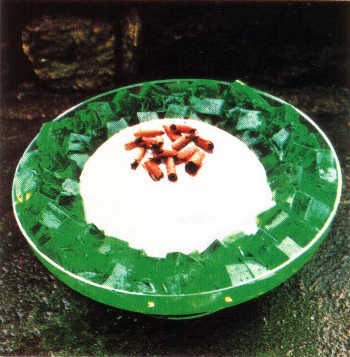 The book suggests serving this with cream, and that would have been good, but it was fine served plain. It’s hard to go wrong with fresh fruit, though I’m not sure about the artificial cherry flavor of the Jell-O. It reminded me by turns of cough drops and of wearing Bonne Bell lip gloss when I was in my early teens. Either way, this made for a bunch of ambiguous Proustian moments. 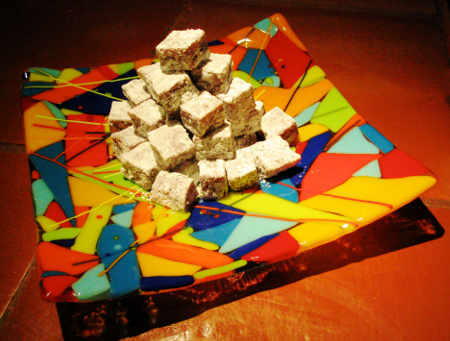 Fruited Gelatin Glaze is kind of a kooky addition to the book. All it is, really, is fruit in Jell-O, except instead of just eating it out of a dish you put it on a cheesecake. 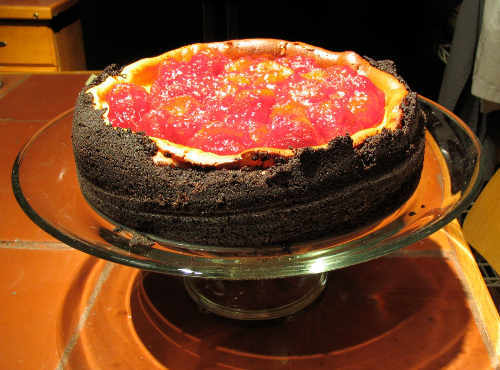 Here we have frozen strawberries in strawberry Jell-O, atop a vanilla cheesecake with a chocolate crumb crust. This is not one that will be difficult to eat. It tastes fine, although the combination of textures is a little weird. 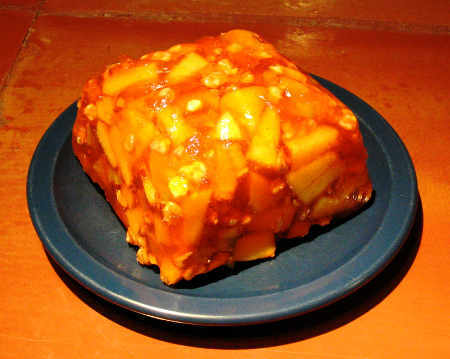 I think I had expected it to be more like the goopy canned fruit toppings you can get in the supermarket. I should have known better. Ah, I’m just feeling cross because I had a hard drive failure at work almost a week ago and it’s really cut into my productivity. In fact, I’m writing this blog entry while I’m at the Lab on a holiday, installing software on the new hard drive – at this moment, a Windows XP virtual machine in Fusion, no less, which is enough to make any Mac fan cranky. Bryan is actually trying to be supportive. Yesterday’s Jell-O’ing included the maiden voyage of the new kitchen clogs Bryan got me for my birthday. (After attempting to “break them in” on the day, I came to the conclusion that they were too narrow and he had to order me the wider ones, which arrived last Friday.) I’m hoping that these will save me from getting backaches as I get caught up on my schedule. Just a few more to go, and I should be all up to date. By the way, I’ve gotten some nice comments lately, and I’d like to thank the folks who have taken the trouble. Knowing that someone is reading definitely helps keep my motivation up when the Jell-Os get particularly nasty. I seem to be picking up readers from the UK, which is exciting to this old anglophile. I’m humbled by and appreciative of everyone’s time and attention.